nly 17% of workers (and 32% of current retirees) are very confident they will have enough money to live comfortably throughout their retirement according to the Employee Benefit Research Institute. What’s worse is that only 38% of retirees are very confident they will have enough money to take care of basic expenses during retirement. If your retirement plan doesn’t cover basic expenses with guaranteed lifetime income, you’re basically rolling the dice. Here’s a look at the EBRI’s “2018 Retirement Confidence Survey” showing how current workers plan to do this, what current retirees are doing, and why working with an advisor will boost confidence in any retirement. Only one in eight workers are very confident that they know how much income they will need each month in retirement or how to even withdraw that income. Social Security is some of the best money, money can’t buy; it provides guaranteed income for life and it is even indexed for inflation every year! Nearly half of workers have thought about how the age at which they claim Social Security can impact their benefit amount. However, confidence in the Social Security system dropped from 51% in 2017 to 45%. 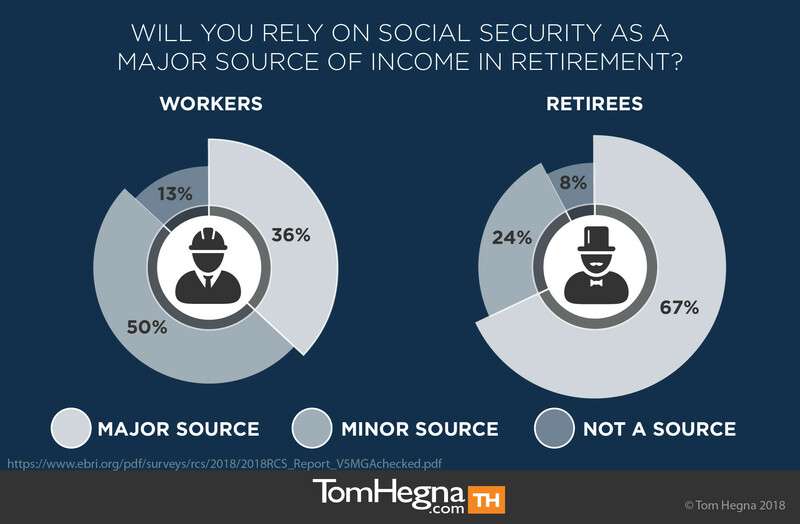 This could explain the huge disparity between workers’ and retirees’ plans to count on Social Security as a major source of income. But if they don’t plan on maximizing this benefit, what is their plan? It’s not that future retirees won’t claim Social Security benefits, it’s just that their confidence in that government program has declined. After all, only 23% of retirees feel the U.S. government will adjust this program in a way that secures future retirements. The median age at which workers plan to claim Social Security is 65, but 40% of retirees claimed theirs at age 62 in 2017. In fact, according to the Social Security Administrations Annual Statistical Supplement of 2017, “71% of the 41.2 million retired workers received reduced benefits because of entitlement prior to full retirement age.” What’s the result of this decreasing confidence in Social Security? Future retirees are expecting to work longer! 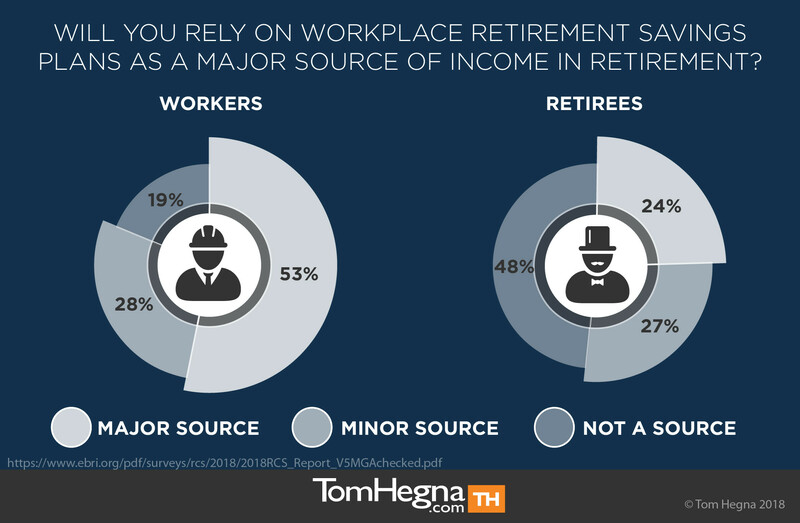 68% of workers expect working for pay to provide income in retirement, but only 26% of retirees actually do. It’s good that workers want to work, and that’s probably why they’re counting on workplace direct contribution (DC) plans (like a 401(k) or 403(b)) to be a major or minor source of income in retirement. Will this plan provide future retirees with a happy retirement? Remember that workers aren’t confident their current plan will provide enough money, and their predecessors are worried about covering basic living expenses in retirement. Well 34% of retirees moved money out of their workplace retirement plan because they received professional financial advice to do so. 80% of workers with a DC plan are somewhat or very interested in moving that money, now or upon retirement, to an option that would guarantee monthly income for life during retirement. Plus, 93% of workers with a DC plan who work with an advisor are satisfied. Step one of the four simple steps to an optimal retirement I wrote in Paychecks and Playchecks: Retirement Solutions for Life is cover your basic expenses with guaranteed lifetime income! Advisors and clients need to work together, discuss the strategies in that book, and create an optimal retirement plan for the future. Bring a copy to your next appointment.